BROWARD COUNTY, FL - Costa Cruises returned to Broward County&apos;s Port Everglades today with a first call by the 2,260-passenger Costa Deliziosa. An Italian cruise line owned by Carnival Corporation, Costa Cruises has sailed from Port Everglades since the 1960s and is returning for the winter season following a four-year hiatus. "Thank you to everyone at Port Everglades for an incredible welcome, both to Costa Cruises and Costa Deliziosa," said Scott Knutson, vice president of sales and marketing for Costa Cruises North America. "Costa Deliziosa is the newest Costa ship to homeport in the United States, and we are excited for North American guests to see firsthand what makes Costa Europe&apos;s most popular cruise line." 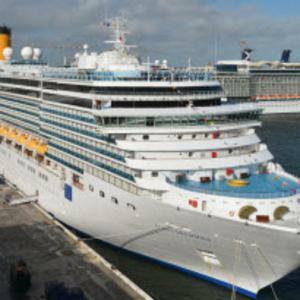 "Costa Deliziosa is a good fit for Port Everglades because it gives our cruise guests the option to cruise aboard a vessel that has a distinct Italian style," said Port Everglades Chief Executive and Port Director Steven Cernak. "Costa Cruises has a long tradition in South Florida, and we are delighted to have Costa Deliziosa join our fleet this season." Costa Deliziosa entered service in 2010 and features stylish Italian décor such as various types of marbles, granite, mother-of-pearl, and Murano glass. The 92,600-gross-ton ship has four restaurants, three pools, 11 bars, the Samsara Spa and a 4-D cinema.